I love to collect old radio items. I don’t really go out of my way to find them, but when they find me, I am very interested in picking them up if they are not too hard on my bank account. I found this beauty at a garage sale today. There were a couple of other radios there also, but I have a family to feed so I purchased only one. The radio was from Montgomery Wards and has the label “Airline” on the back. I have not had a chance to really dig into the innards or look for information about the radio yet. The radio is a dual bander consisting of the broadcast band and the shortwave band from 5.75 to 17 Mhz. Click the picture to see a slide show of the details. 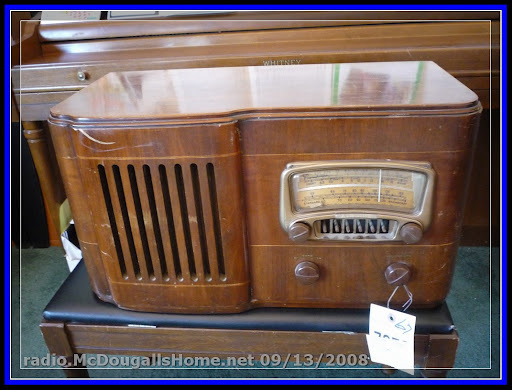 If you know anything about this radio, please leave me a comment.